Miami Gardens Movers – Here at Discount South Florida Movers, we know how much stress a move can cause. Let our team of expert movers remove that stress for you. Rest assured that the safety of your belongings is our top priority. We offer the lowest rates around and don’t sacrifice quality to provide them. We guarantee the safe and timely delivery of your items. 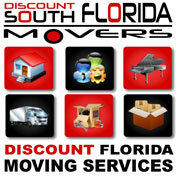 The professionals at Discount South Florida Movers can do it all. With over 15 years of experience serving the area, we can do any job residential or office, day or night. We can accommodate special requests like moving of a piano. Distance isn’t an issue either. Whether you want to go move down the street or across Florida, we can help you. Miami Gardens is a diverse suburban city of 110,000 people. It got its name from the historic drive that runs through it. Historically, the city started to become populated in the 1960s when I-95 was being expanded. Many African American and West Indian American families took advantage of the new development and moved from other neighborhoods like Liberty City. The city has a few well known landmarks. The Miami Dolphins reside in the city and play in the Sun Life Stadium. The Orange Bowl is also famously played here. In addition, the Antioch Mission Baptist Church is based here and their 7,500 member parish is extremely active in the community. Discount South Florida and Miami Gardens movers provide low rates on residential, commercial, piano and long distance moving.